As usual, at this time of year, any number of articles and posts have been written identifying key trends in a range of service industries and technology areas for 2017. In the customer experience space, I must have read at least 15 articles highlighting a whole range of 2017 customer experience trends including chat-bots, personalisation through big data, omnichannel experiences, mobile customer experience, apps and artificial intelligence. These articles have made me more and more frustrated as I have read them. The main reason for this is that on the ground, working with clients, it is still very obvious to me that in order to provide customers with a better experience the vast majority of companies need to focus on one big thing  getting the basics right  before they try to embrace new trends and technologies. Whilst the trends identified in most articles are generally correct, and the use of new technologies and ways of working to deliver CX improvements will grow, if companies dont get the hygiene factors around customer experience right and instead jump straight to the latest fad or new system, they will fail to deliver real improvements that stick. What it boils down to is that if the right hygiene factors aren’t in place, any new piece of technology or system will not help companies succeed in giving customers what they want. Instead, they need to make sure they do the following things well and have them in place, before moving on to the next big trend or technology. This is critical. Many, many companies think they understand their customers, but actually have no idea what customers want from their service, or how they want to interact with the company. Make it a priority in 2017 to understand what customers want to achieve when dealing with your company. Many companies have not developed a customer experience strategy aligning everyone and everything in the company around the experience that the business wants to deliver to its customers. Without this, it is extremely difficult for any company to successfully deliver great customer outcomes. Whenever a customer deals with your company they are trying to achieve something (buying, getting help etc.). These outcomes are delivered through (often) a series of interactions with the business  i.e. a customer journey. Focus in 2017 on understanding what journeys your customers are undertaking when dealing with your company, and optimise these to deliver the outcomes the customers desire in an easy and effortless way as possible. Too many senior leaders in companies lose sight of the fact that customer outcomes in their business are delivered by their people, whether the business ultimately uses digital or physical channels for delivery. Thus, it is critical that the culture within the company reflects a focus on the customer, and delivering successful customer outcomes. Defining and driving such a culture is hard work, but should be at the top of the priority list for all companies. In order to successfully deliver great customer outcomes on a consistent basis, companies need to have internal processes in place which work for customers, every time and all the time. Many companies (especially those which have grown quickly) havent invested a lot of time or effort into ensuring they can manage their processes effectively and deliver these great customer outcomes. It is time to focus on this in 2017 and get this right. Whilst focussing on trends is important for any business to stay ahead of the curve, it is equally if not more important to ensure you are delivering real improvements in business and customer outcomes to ensure ongoing success. 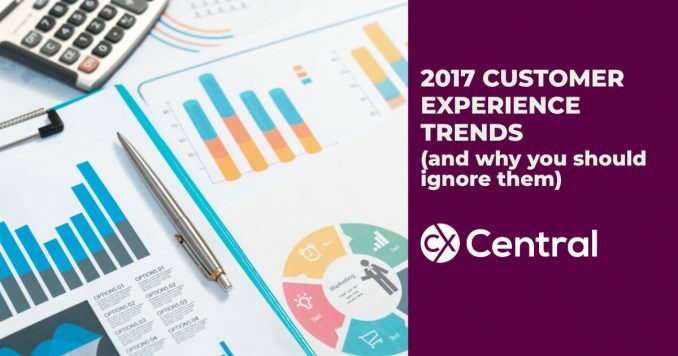 Focus on these customer experience basics, and you will be well down the path towards a successful 2017 and beyond! Shane Goldberg is a regular presenter in Australia running his popular training courses. See what’s coming up on CX Skills. Get help with your CX Strategy – we’ve got solution providers from consultants, technology suppliers and more in our Business Directory.